Cupcakes 'n Daisies: A Bump in the Road . . . . 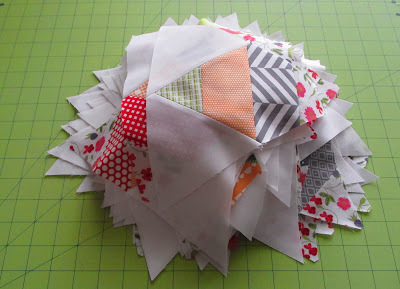 So here's my stack of pieced triangle units for Starlight, the pattern by Camille for thimble blossoms. (click here for pattern detail) They went together perfectly, and by using the Creative Grids 60 degree triangle for the pieces and parts, the points lined up perfectly to create the required 1/4" space above those triangle points. So the only thing left to do was to put the pieced triangles and large floral triangles on my design wall and start sewing everything together. But then I noticed that the large triangles that I cut, at the required pattern size, were not big enough! My pieced triangle units are an 1/2" larger than the cut triangles. I could not for the life of me figure out where I went wrong, because I checked and double checked and squared up every step along the way. Then a friend figured out my problem, using the 60 degree triangle created this difference. The pattern says, "Using your rotary cutter and small triangle template (or a 60 degree ruler)…." Note is says 60 degree ruler, not 60 degree triangle. 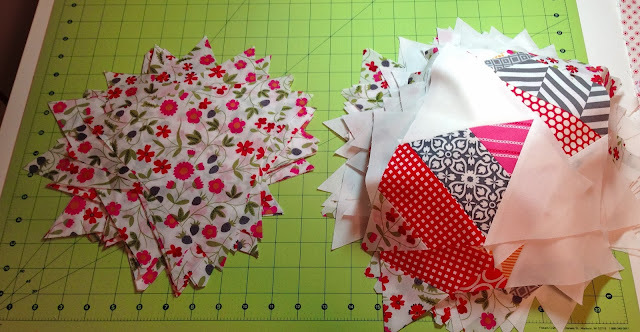 I cut my large floral triangles out first, because I wanted to make sure I had enough fabric for those big units plus the small points for the centers. And I just barely had enough fabric as it was. But had I not cut them first, all I needed to do was to cut bigger triangles and everything would be perfect, but that's not possible now. 3. 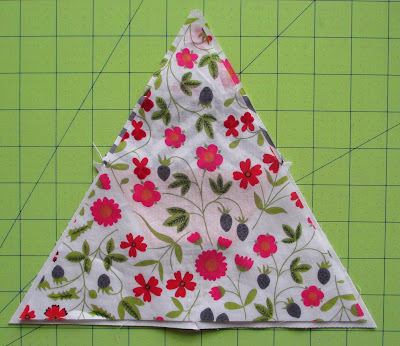 Take the white triangles off the pieced units, un-sew the the pieced two triangle units, trim a 1/4" off those triangles, sew them back together, trim the white triangle units to a new size, sew them back on. So really, I only have one option, and that's number 3, and that's my plan. I have started un-sewing the pieced units but it's not fun, and the thought of trimming and sewing them all together again has really taken the wind out of my sails. 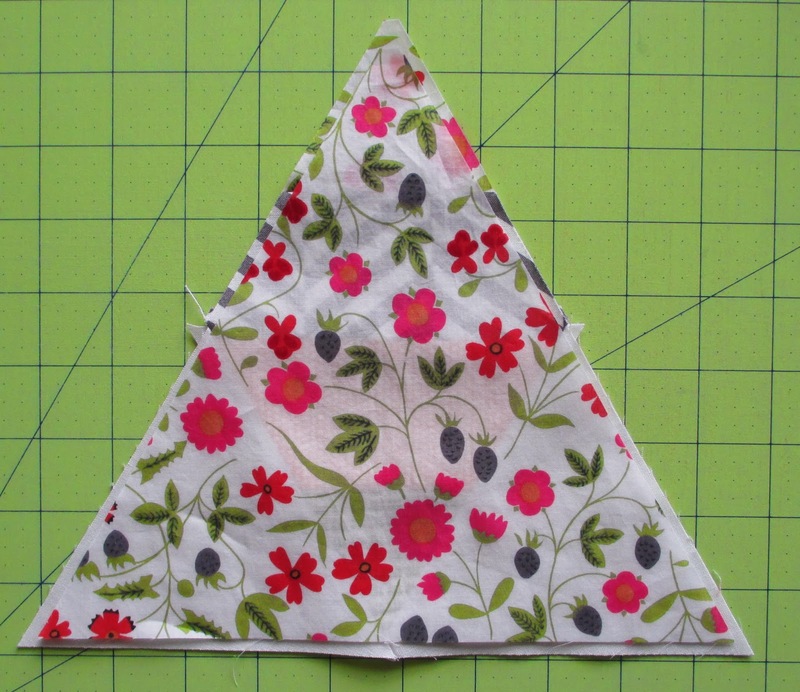 I keep thinking of how hard I worked last week each morning to get through my To Dos in order to get up to my sewing room to work on those triangle units each afternoon, all the while the large floral triangle units, that I cut first, were just sitting there, wrong. I've lost that loving feeling for this project, I'm hoping once I get those pieced triangle units down to the size I need, and start putting everything on my design wall, things will look up. If you're going to make starlight, I recommend using the Creative Grids 60 degree triangle, it makes the piecing a breeze, just cut your large triangle units a 1/2" larger and you'll be great. Or better yet, measure your pieced triangle units, preferably after the first one, not the 124th one, and see where you stand, that's the size you need to cut your large triangles. And finally, I guess there's always the option of just following the pattern, but where's the fun in that! I'm so sorry for you Thelma, take heart ! Oh, no! It's good that there's a fix, but I feel your pain. A positive spin on this - the quilt is so nice that you've made it twice!! If it makes you feel any better, the same thing happened to me! I have taken the leave it in a corner until you can get the energy to unpick option! Ouch....I feel your pain. Have made similar mistakes in my quilting adventures over the years too. I'm sorry you have to do all that work, but it is the option I would do, as well. Remember me replacing all the centers on my Dresden quilt?! I feel your pain. Maybe you can do the ripping while watching football or something? Don't let the wind out of your sails, I'm looking forward to seeing how all your fabric choices meld with the pretty London floral! I feel your pain. I have a project where I need to do a tremendous amount of unsewing before I can move forward on it. I've decided to work on that at night while I sew on other projects during the day. Slowly, it will get done. And after the quilt is finished, I'm sure it will eventually become just an amusing story! Sometimes quiltmaking is a humbling experience...sigh! Put in a good uplifting movie to pass time unsewing. You know the finished quilt will be wonderful!!! Oh no!!! Although there's quite a bit of work to do to fix the problem thank goodness there is a solution. I hate the thought of trashing the whole project. Ugh! Oh boy, you are a better quilter/person than me! I would try to find more fabric to re-cut the triangles....if I have to un-sew very many pieces then it all goes in a tub and I probably wouldn't see it again for years. Awww! No fun at all! Take care. Well, that stinks! But I'm sure there is a lesson in here. At least the weather is cold and you can just slow down (let the rest of us catch up - hahaha) and have a cup of hot tea, while you pick away, and contemplate the rest of the quilt. If it had been summer, I may have put it away until it got cold - See? You're already ahead!!! *huge wink!! OH no Thelma! WHy does that always happen when the fabric is precious and limited??! You need to host an "unsewing" party, where everyone gets a seam ripper and a drink, and you go to town! That is just awful! I am missing something here. Why should using a 60 degree triangle as opposed to a 60 degree ruler make any difference in the cutting? What a disaster. I am so sorry that this happened, but at least you are clever and can put things right, even though it will be a boat load of trouble to do it. Puts me in mind of those 500 half square paper pieced triangles I made all the wrong size. Oh nooooo, sorry to hear that! Even though the best solution is a long and tedious one, in the end I think you will be happy that you endured and did it! Here's my "cyber hug" of encouragement for you! Super bummer. I had that happen to me on a different pattern with 60 degree pieced blocks and I have not touched it since then. I guess you could consider it your Battle of Britain - but those Liberty of London prints are just so special. Oh Thelma...so sorry to hear about this bump in the road but know you will get all back together and just hope you will still love this pattern when you get there. Good to let others know about this size issue before they start down the same road. So, hope things fall back into place and start to move forward for you.....will cross my fingers. Oh goodness... I guess this will be your "Clover" quilt? I'm sorry you have to unsew, but you can't waste that precious and beautiful Liberty fabric. I'm sure you will be back on track before you know it. I am still so sick over this!! Ahhhh!!! I have a rectangle shaped ruler with 60 degree marks, not an actual triangle shaped ruler, and my pattern testers had the same thing. Who knew the different shapes yielded such different sizes? I've made notes about this on my corrections pages and all my listings, but I still feel like I need to make it up to you. I'm so sorry Thelma! Uggh how awful! If you had extra yardage you know they would've been perfect! As i readthe options i knew you would pick three cause everything you make is gorgeous and perfect :). Oh and how cool is it that Camille herself has commented on what happened and wants to make it up to you. I think i would be floating....she's just the best! there is no fun in following the pattern - not for you and not for me!!! Thelma, been there, done that. You've made the right decision, though. That fabric is too cute to discard. I know - send a stack to each of your quilting buds to help you un-sew. Then it will be less daunting. Either way, best of luck! Thelma, you've been in similar situations before (remember Carolina and Stars a Above My Red Chateau?) and you took things apart and fixed them until you loved them again. I know it's frustrating to put in so much work only to have to do it all over, but you'll be happy you did (eventually). I had a problem once with a pattern that gave an incorrect size for a ruler. My triangles ended up being too small, and I had to figure out the math to change the whole pattern. I did get it figured out and it ended up being one of my favourite quilts. Hopefully that will be the case for you too. Oh no, so sorry. Good thing you have come up with a plan, I would hate for you to not be able to include that special floral fabric. It's nice to think you have options but I agree with you...there is only one. Not one we like but at least it IS an option. I UNsew so much better than actual SEWing...sad, isn't it? Oh no! I am having a hard time wrapping my brain around the 60degree thing though. A ruler or a triangle... 60 degrees is 60 degrees...no? You are a trooper though and I know you will still come through this a winner, with a beauty of a quilt AND a story to go with it. I have to agree with the others, get a good movie, a tall drink, and a sharp ripper. You did have another option. Two quilts. You could have bought more fabric to go with the pieced ones. And then found a fabric that would go with the London fabric. Maybe a solid, cut more pieces the same size and alternate. Kind of a thousand pyramids. The starlight would have ended uo larger but not ripping. I hear you about bumps in the road. I have them all the tim. Hopefully by know you bump is smoothed out and you are back on the road again! As frustrating as unsewing will be, I suspect that once you get going again, you'll be really happy you did this. Arrgh. I hate it when that happens! Anyway, whatever you do, you will finish your quilt and it will be beautiful! Thanks so much for sharing your bump in the road, Thelma! When I saw your first post about this quilt I raced right over and purchased the pattern to download. Not sure when I'll ever get to it but I've made a note on the pattern based on your experience and am grateful to have been forewarned. Oh no Thelma! Major bump in the road. I'm sorry for all the re-work you will be doing but I think in the end, well worth it! I feel your pain my friend! Just box it up and send it to me. I will do all the unsewing for you and send it back! You need a break! P.S. I would have done the same thing... I have the same ruler. I have an ancient flying geese pattern which is now eeking close to 32 years old that I finally pulled out and took apart and started to trim, and sew. I do a few at a time, maybe by the time I am done the rose burgundy and federal blue color scheme will be back in style. Oh no!! I think I would have cried. That beautiful Liberty fabric is just too precious. After the long haul of unsewing, I am positive that this will be a most fabulous quilt and you will be happy with your decision to do all that work. I wish I lived closer so I could help you unsew.